DualLayout - Complete HTML freedom in SharePoint Publishing sites! Main complaint about SharePoint Publishing is HTML output size and quality. DualLayout to the rescue: complete HTML freedom in all your publishing pages! In this post I will introduce our approach, in later posts I will go into details on my personal vision on how you could build Internet facing sites on the SharePoint platform, and how DualLayout can help you with that. The master page template contains the information that is displayed across multiple page layouts like headers, footers, logo’s and navigation. The master page is used to provide a consistent look and feel to your site. 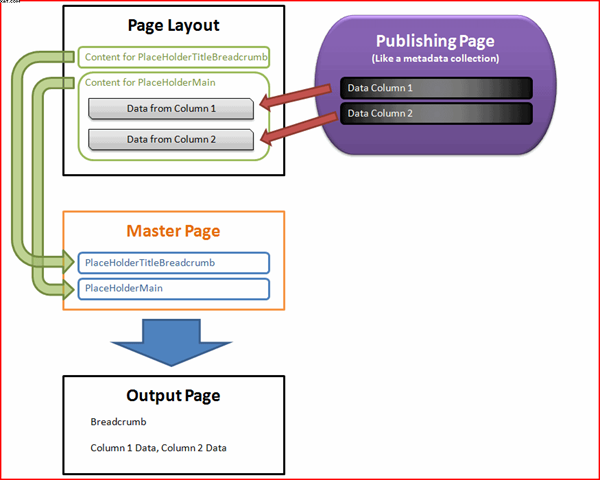 The page layout template is associated with a content type that determines the set of fields that contain the (meta)data that can be stored, authored and displayed on a page based on the page layout. Within the page layout you can use field controls that are bound to the fields to provide editing and display capabilities for a field. A page is an instance of a page layout. The master page used by the page is configured by the CustomMasterUrl property of the site a page is part of. A SharePoint Publishing page can be in edit or display mode. The same SharePoint master page and page layout are used in both the edit mode and display mode. This gives you WYSIWYG editing. All these requirements are not easy to fulfill if you have to migrate an existing internet site to the SharePoint 2010 Publishing platform, or when you get a new design for your Internet site from a design agency. The people who created the design and site interaction in most cases didn’t design with SharePoint in mind, or they don’t have knowledge of the SharePoint platform. When you want to make your design work together with the SharePoint styles heet you need a lot of knowledge of SharePoint. Especially with MOSS 2007 people like Heather Salomon became famous for dissecting and documenting the SharePoint CSS files to prevent designers from branding nightmare. Things got a lot better in SharePoint 2010 with the introduction of the context sensitive Ribbon at the top of the page, instead of editor bars injected into the design. But still many of the same issues remain. Enough about the problems, lets get to the solution! It became a kind of competition within our company which approach would be best, and we managed to do both. But we also managed to do the second which we named DualLayout. 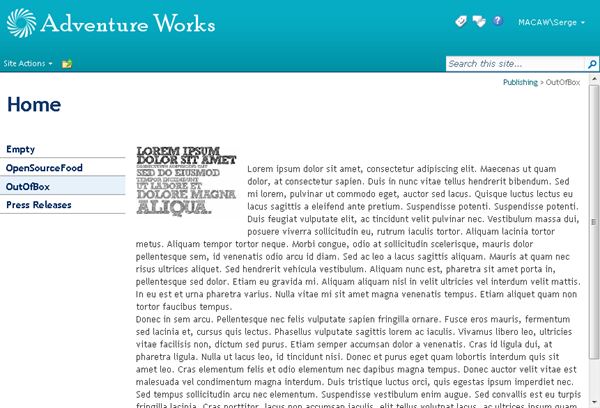 We created an approach where we can introduced an additional mode to SharePoint Publishing pages. 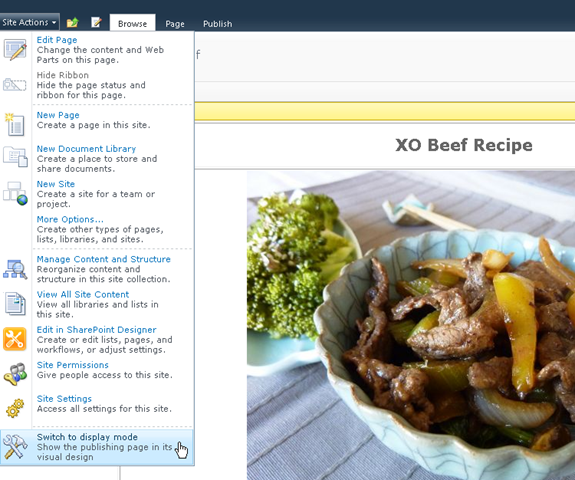 Besides the SharePoint Publishing WCM mode with it’s edit and display modes, we introduced a view mode. The view mode is a mode that gives you a view-only version of the page where you don’t have to bother about the page going into edit mode, and also don’t need the plumbing to enable your page to go into edit mode. 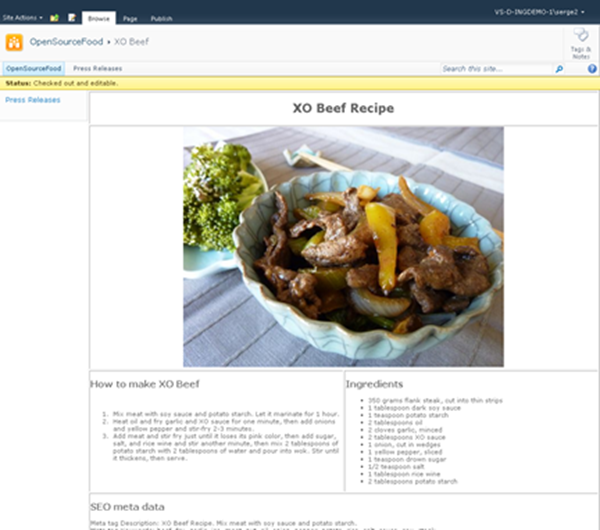 The standard SharePoint display mode using the master page and page layout with all the required controls and the field controls rendered in display mode. 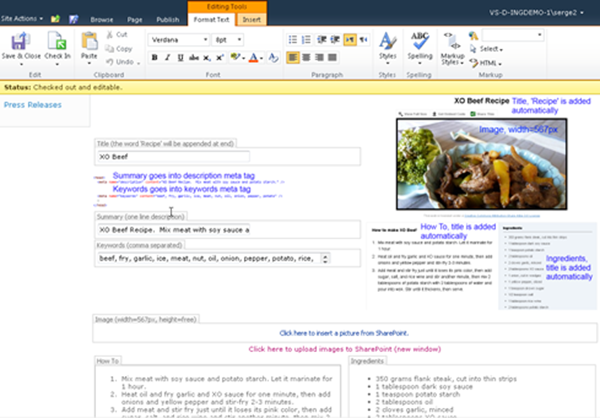 The standard SharePoint edit mode using the master page and page layout with all the required controls and the field controls rendered in edit mode. The additional view, with complete freedom in HTML, no requirements for controls or ASP.NET single web form. And how is this accomplished? We made it possible to have a master page and page layout for WCM mode (edit, display) and a master page and page layout for view mode (display only). Depending on the mode we display the page with the correct master page and page layout. 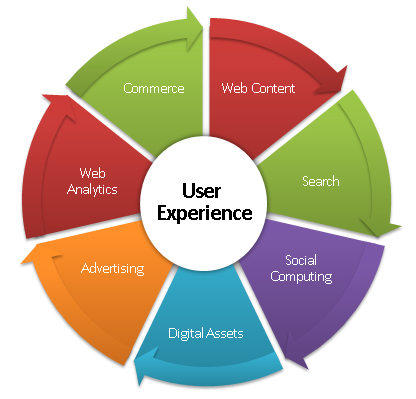 This gives us complete freedom in designing an end user view separate from a content author / approver view. 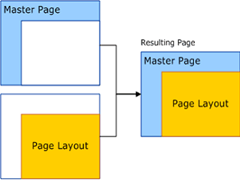 The WCM master page and page layout are the domain of the SharePoint specialist. She can go for completely WYSIWYG editing, or use the out of the box v4.master master page to stay as close as possible with the SharePoint look and feel so the content authors recognize the UI from the SharePoint text books. 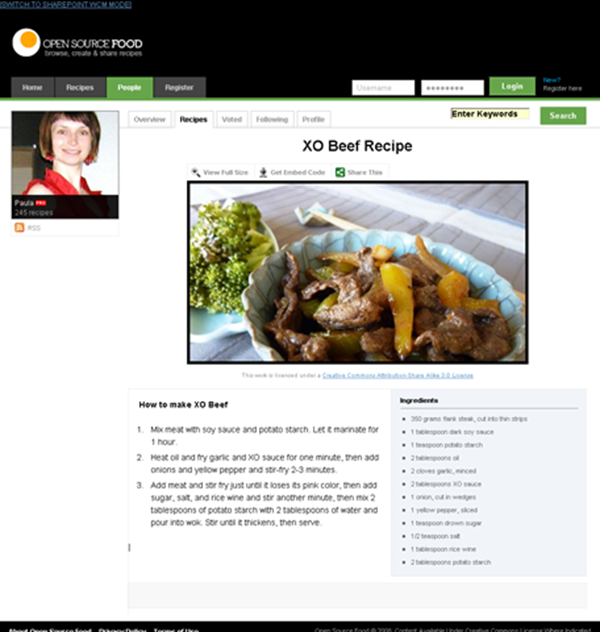 Below some screenshots of an example I made with DualLayout based on the web site http://opensourcefood.com. In a next post I will go into detail on how I created the example using DualLayout. In this example I use the out of the box v4.master master page for the WCM mode (edit/display) where I give a schematic preview of the content in WCM display mode, and provide guidance for the content author in WCM edit mode. In the view mode I generate the exact HTML as is used in the actual site http://opensourcefood.com, without any compromise. If you are in the SharePoint Publishing View Mode, and you have the rights to author the page, there is a link that the designer can put in any location on the page to switch to WCM mode. In the zoom below you can see that we created it as a simple link at the top of the page. This link is not visible for the end user of your site. DualLayout gives you all the freedom you need to build Internet facing web sites on the SharePoint Publishing platform,the way you want, without any restrictions. In the next post I will explain how I created the OpenSourceFood sample. 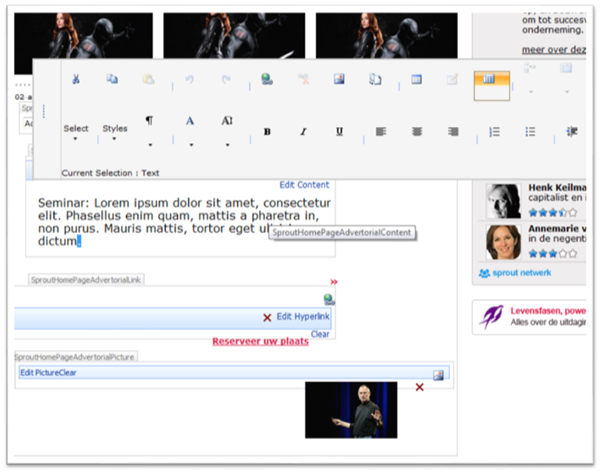 DualLayout works on both MOSS 2007 and SharePoint 2010. I will make a full-featured download available soon so you can try it out yourself. Let me know if you are interested. Why use SharePoint Publishing for public internet sites? Is SharePoint the best Web Content Management System you can get? Is it the best platform for your internet sites? Maybe not. There are specialized WCM platforms like Tridion, SiteCore and EPIServer that might be better. But there are many reasons why you would use SharePoint over the many alternatives. 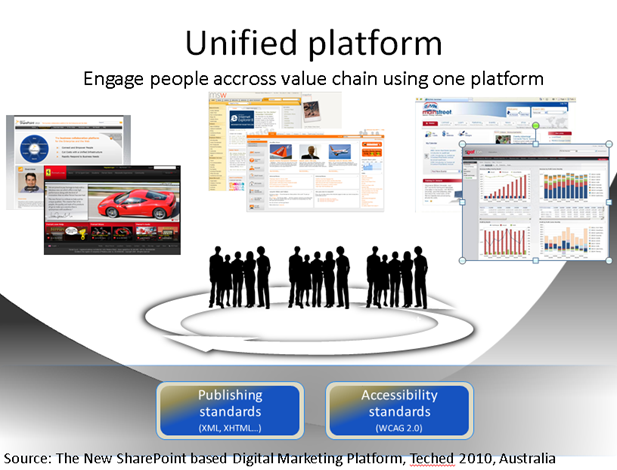 Strategic platform for many organizations – SharePoint is a platform that works great for intranets and extranets. It is often selected as the strategic web platform within an organization. There is a SharePoint unless policy. So why not do the public facing web sites on SharePoint as well? Unified web platform – In these organizations SharePoint is used as the unified web platform that is used for team, divisional, intranet, extranet, and internet sites. This unified platform promises to reduce cost and increase agility. Reuse of knowledge and people - Unified Development, Unified Infrastructure; the same skills can be reused for development and maintenance. Existing relationships – the Communication department (focusing on Intranet/Extranet) and the Marketing department (focusing on Internet) are either the same group of people, or working close together. Support from the community – SharePoint is one of the Microsoft server products with the best community support in blogs, support sites and open source projects. For example on http://codeplex.com you can find 1300 open source projects related to SharePoint, versus for example 27 projects for EPIServer. SharePoint is a development platform – SharePoint isn’t just an out of the box product, it is a development platform that you can extend at will, like an infinite number of companies already did to provide you with tools for all the (many) gaps that exist in the out of the box SharePoint offering. But if you look at the Internet sites that are built with SharePoint Publishing, some people are a bit disappointed. Microsoft’s classic showcases like http://ferrari.com and http://www.hawaiianair.com deliver pages with 1000+ lines, and 100+ validation errors when you run the W3C validator. 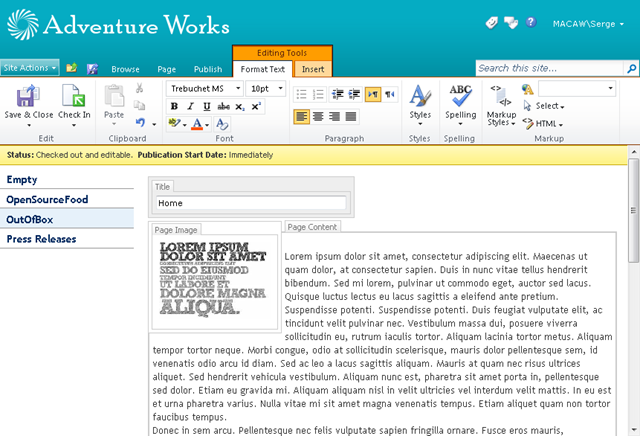 But there are also a lot of great sites that use the SharePoint Publishing platform. Have a look at http://www.wssdemo.com/livepivot/ for a nice overview of those sites. In a future post I will describe our approach to delivering quality HTML on the SharePoint Publishing platform. We call this approach DualLayout.